Everyone knows the story of the raucous, debauched Earl of Rochester – everyone, that is, apart from apparently Stephen Jeffreys. 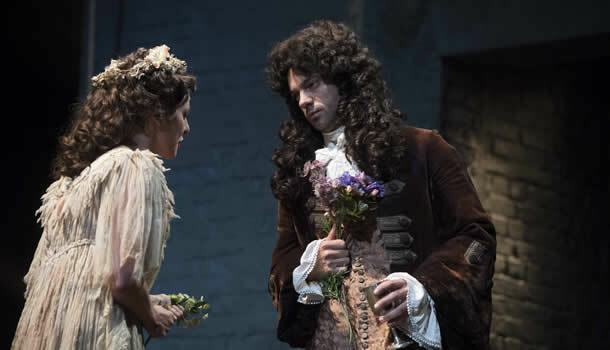 The Libertine opens with a brooding Dominic Cooper proclaiming “you will not like me”, and although he's not far off the mark, it's the play that sets you at odds. First written in 1994, and experiencing many rewrites in the midst, The Libertine is supposedly biographical. History dictates that the erratic Earl simply couldn't keep it in his trousers, but this rather lacklustre play sees them firmly buttoned. It's very funny at times, in-keeping with the Restoration period – although you can't help thinking back to the recent Nell Gwynn, which achieved the bawdiness and hilarity with so much ease. Mark Hadfield gives a great performance as writer George Etherege, whilst Will Barton evokes Blackadder-style humour with a very Baldrick-like Alcock. One particular scene, where Etherege pays off some guards, is hugely amusing as he drunkenly falls about the stage. But here in lies the problem. Jeffreys' play struggles with what it wants to be. It's not funny enough to be a Restoration comedy, nor is it clever enough to be a shocking insight into Rochester's life. Terry Johnson directs with an apt hand, but it all seems very rushed, never quite delving into the complexity of Rochester and his troubled life. Cooper dons the curly wig and is a convincing self-destructive revolutionary, but he lacks the magnetism that makes Rochester such an interesting subject. His chemistry with the ladies is questionable, particularly his lusting after actress Elizabeth Barry, played by Ophelia Lovibond. She gives a strong and convincing performance as the sparky young actress, but you can't help wondering why she would fall for someone as dull as the Earl. Nina Toussaint-White is a charming prostitute, if there could ever be such a thing, but is equally dispensable. Tim Shortall's design is a stand-out of the piece, evoking several different locations atop a raised wooden platform. Framed by a large golden picture, projections change for each scene, which is highly effective. Early on in the play, the line is uttered “a poem. A play. Something of substance.” It's a line that lingers in the air until the curtain call. What if the Earl's poems had been used to more effect? The Libertine is by no means a complete bore, but it's a shame to see something with so much potential still not reach its peak after more than two decades of rewrites.